The holiday shopping season can be a great time for Main Street organizations and Chambers of Commerce to support local merchants and other downtown businesses. There are plenty of different paths you can take to encourage support for business districts. 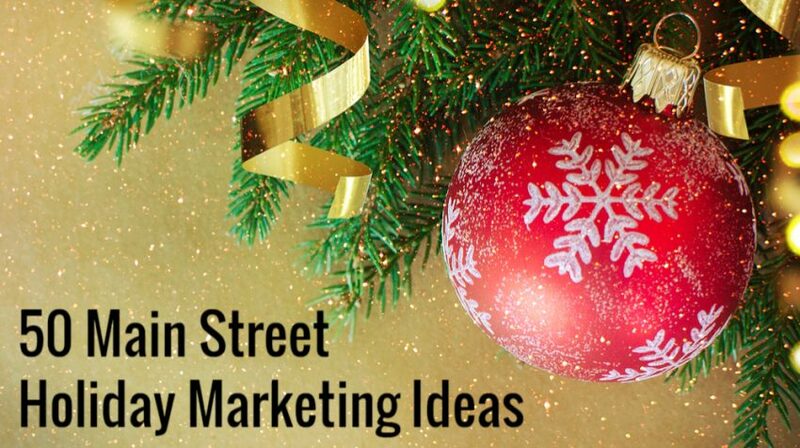 Here are 50 different ideas for marketing Main Street this holiday season. If you want to showcase all the different products people can buy from local businesses, put together a gift guide, either in print or online, to offer some ideas. You could also print out a special magazine or brochure that includes information about local retailers and other businesses and deliver it to nearby residents. Special events like parades, tree lightings and more can attract people to a downtown area. Then you can include sales or other promotions specifically aimed at getting people to buy from local businesses. Or you could host a regular event once a week or so. This allows customers to get into the habit of visiting the business district and lets them know when there’s likely to be a lot going on in the area. If you’re in an area where it’s not too cold, you could have local businesses set up some of their products outside so that people attending those local events don’t even have to go out of their way to see some of the products available. Having an online presence on sites like Facebook can be a great way to alert people about local events and promotions. So you could create a Facebook page specifically for the downtown area so that local residents can follow for updates. To drum up more sales for a variety of different local businesses, you could have business owners trade coupons, flyers and other promotional materials to give out at their locations. You could also host an event where you let kids get their picture taken with Santa Claus at a centrally located part of the local business district. Or you could even have Santa move around to visit multiple different business locations. A contest or scavenger hunt of some kind can be a great way to get people to visit multiple different locations throughout a downtown business district. You could organize your own scavenger hunt with local business owners and even give it a holiday theme. You could also offer some kind of food or treats that people can get at different businesses. Then have each business include flyers or information about what items they can get from the other businesses in the area. For those customers who aren’t sure exactly what they can get at every downtown business, print out some informational maps and have them available at prominent locations throughout town. Consumers are likely to want to do some kind of charitable giving during the holidays. So you could set up a mitten or giving tree with some requests from local families in need. Then shoppers can buy those requested items and drop them back off downtown. To create a really festive environment in your area, you could hire local musicians to play holiday songs for shoppers in the area. You could also create a calendar that includes information about local businesses and any relevant promotions. Gift cards are really popular during the holiday season. And you can help local businesses in your area gain some business having them team up to offer gift cards that are usable at a variety of different downtown locations. People also love looking at impressive light displays throughout the holidays. So if you can get local business owners to team up to create a cohesive display throughout the business district, it could attract even more shoppers to the area. There are plenty of themed movies that are popular throughout the holiday season. You can set up a big screen outside or at a local business and invite customers to come downtown for a special viewing. For customers that want to browse around different downtown businesses, you can make it easier for them by providing some kind of fun transportation like a trolley or even horse and carriage rides. To support restaurants, theaters and other businesses in your downtown district, you can create gift certificates that they can use for a dinner and a movie or similar night out. You can even get smaller businesses that might not have a physical location involved in your Main Street holiday promotions by hosting a craft fair or similar event in the area. When promoting your downtown area in stores and online, it’s a good idea to have some kind of recognizable graphic that people will recognize. You can even make holiday themed graphics to really get people into the spirit. To encourage people to share their experience patronizing local businesses, you can create a special hashtag just for holiday shoppers and local customers. You can also put up signs reminding people to check into your downtown district and specific local businesses on Facebook. And you can spread the word about all the different businesses in your downtown district by creating an informational video and posting it on YouTube. To share relevant products and business information on Pinterest, you can create some themed pin boards to showcase specific types of products from local retailers. To show off the philanthropic spirit of your area, you can choose a local charity and invite members to come to your area and collect money or educate people about a cause. Or you could even get multiple businesses in the area to donate proceeds to a particular charity. When you host an event in your downtown district, it can be a good idea to send out actual invitations to people in the area who might not otherwise hear about the opportunity. Consumers love winning free things. So you could organize a giveaway with multiple local businesses so that one or more customers has the chance to win a curated selection of local items. You could also have a district-wide cookie decorating contest where people can show off their skills throughout the season for the chance to win specific local prizes. Or you could give customers the opportunity to make some holiday decorations at different local businesses. And then those businesses can use those homemade decorations to create a unique and festive environment. There are many ways that shopping local can help the economy and local residents. So you could create a video, brochure or other marketing materials to remind customers of some of those benefits. Many communities have parades around the holiday season. And you can use those events as a way to get the word out about different businesses in your community by making your own float or display or even sponsoring the event. If you have any historical buildings in your downtown area, you could offer tours aimed attracting those who want to learn about the history of the area. To offer even more options for shoppers, you could set up extended shopping hours for some businesses in the downtown area. You could also offer outdoor winter activities like ice skating to attract more potential customers to the area. To show off some of the offerings of local businesses and to publicize events or promotions, you could sponsor or pitch stories to a local newspaper, magazine or even a popular local website. You can also get customers engaged online by having some type of contest where customers can submit photos, stories or other items on social media. Throughout your downtown area, you could show off artwork from local artists to encourage people to walk around and see all of the different pieces. You could also set up photo opportunities like some cool backdrops or props to encourage customers to share their experience of shopping in your community. Those who really like shopping local might even buy some products with that message. You could sell items like t-shirts and tote bags with your downtown district’s slogan and then use the money to support promotional efforts. Every year, there’s some kind of trend, like flash mobs or this year’s mannequin challenge, that gets a lot of attention on the internet. You could organize one of those stunts with customers in your local community. This would get people to come to the area to participate and also get you some attention online. What might be Main Street the rest of the year could be Christmas Avenue or Candy Cane Lane during the holiday season, just for a little extra holiday cheer. A giant tree is a must for any festive holiday shopping district. You could even have a big tree lighting event to kick off the holiday season. Many charities accept items like winter coats or canned goods to help families in need. You could have local businesses set up boxes to accept those items from customers and then facilitate the donations. To make gift giving a bit easier, you could set up a website with different products and gift cards from local merchants and then let customers create wishlists that they can send to people. Reusable bags can help the environment and spread positive messages throughout the holidays. You can provide stores with some reusable bags that include messages about shopping local. There are plenty of opportunities for special events throughout the holidays. But you can get even more specific with the consumers you target by hosting events like “girls’ night out” or kid-focused activities. Sporting events like races or games can get people to visit your downtown district. You could organize this type of event and then have local businesses sponsor it for publicity. You could also get more people to visit the area by setting up some special pop-up shops for a limited time. And throughout the year, you might consider starting a loyalty program so that consumers can get rewarded for shopping at any participating local businesses. PREVIOUS POST Previous post: What is USPS Every Door Direct Mail and Which Small Businesses Should Use It?